The stomach is the widest part of the gastrointestinal tract, and has a J-like shape. It is located between the abdominal esophagus and the small intestine, in the epigastric, umbilical, and left hypochondriac regions of the abdomen. It occupies a recess below the diaphragm and anterior abdominal wall that is bounded by the upper abdominal viscera on each side. The stomach is designed to accommodate accumulated ingested food, which it mechanically and chemically prepares for digestion and passage into the duodenum. It acts as both a food blender and reservoir, but the stomach’s main function is enzymatic digestion. The gastric juice produced by the stomach converts the mass of food into a semiliquid mixture termed chyme. This enables the quick passage of food into the duodenum. The stomach is divided by arbitrary lines into four regions: the cardia, the fundus, the body, and the pyloric region. To some extent, the internal and microstructural features of these regions vary. The cardia is the region surrounding the opening of the esophagus into the stomach. The fundus is the dome shaped area that projects above the cardiac orifice to lie in contact with the left dome of the diaphragm. 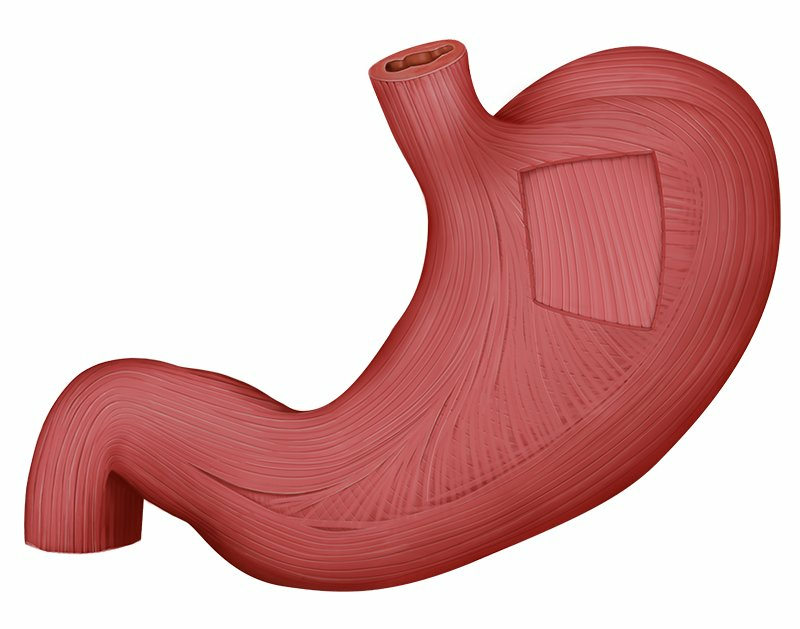 The body of the stomach occupies the largest area. It extends from the fundus above, to the pyloric antrum below, forming the greater and lesser curvatures of the stomach. The pyloric part is divided into the pyloric antrum and canal. The pyloric antrum extends from the body to where the stomach narrows to become the pyloric canal. The pylorus is the most distal portion of the pyloric part of the stomach. It is marked by the pyloric constriction and contains a thickened ring of gastric muscle that surrounds the pyloric orifice, known as the pyloric sphincter. The stomach has other important features. The greater curvature is formed by the fundus and the lateral border of the body of the stomach. It gives attachment to the gastrosplenic ligament and the greater omentum. The lesser curvature is four or five times shorter than the greater curvature. It extends between the cardiac and pyloric orifices, and forms the medial border of the stomach. It gives attachment to the lesser omentum, and contains the right and left gastric vessels. The cardiac notch is another prominent feature of the stomach. It is created when the lateral border of the abdominal esophagus joins the greater curvature at an acute angle. The arterial supply of the stomach includes the left gastric artery that arises directly from the celiac trunk, the right gastric artery arising from the hepatic artery, the right gastro-omental artery arising from the gastroduodenal artery, and the left gastro-omental and posterior gastric arteries arising from the splenic artery. The veins of the stomach follow their corresponding arteries, and ultimately drain into the portal vein. The course and distribution of these veins can be highly variable. The stomach is innervated by both parasympathetic and sympathetic fibers. The parasympathetic fibers originate from the anterior and posterior vagus nerves, while the sympathetic fibers originate from the fifth to twelfth thoracic spinal segments (T5-T12), and are mainly distributed to the stomach via the greater and lesser splanchnic nerves. Want to learn more about the Stomach?